Scottish author George MacDonald Fraser was famed for his legendary Flashman series, featuring the incorrigible knave Harry Flashman, a soldier in the imperial British army. 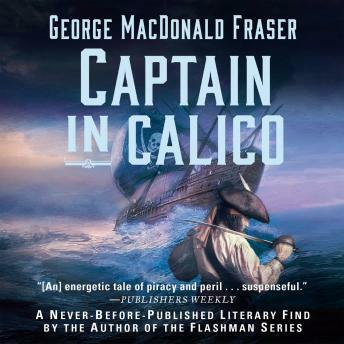 In the colorful standalone Captain in Calico, the first novel he ever wrote but which has never been published, Fraser introduces another real-life anti-hero: Captain John Rackham, called Calico Jack, an illustrious eighteenth-century pirate who marauded the Caribbean seas. On a tranquil evening in the Bahamas, Calico Jack, long wanted on counts of piracy, makes a surprise appearance at the Governors residence and asks for a pardon for himself and his men. A deal is brokered after Jack reveals the motive for turning himself in: love. When Jack last set sail from the Bahamas two years ago, he left behind a beautiful fiance acute, and he recently learned that she remains unmarried. What the governor does not reveal to Jack is that while he was off pirating, his beloved has become betrothed to a new man the governor himself. It doesn't take long for this truth to come to light, and after embarking on a new romance with famous Irish pirate Anne Bonney, Jack is quickly transformed back into a thieving captain in calico.